Already means that something happened earlier than we expected. 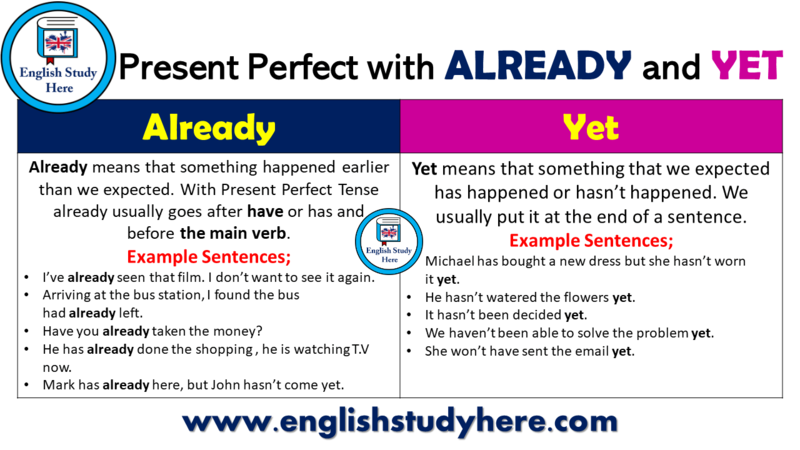 With Present Perfect Tense already usually goes after have or has and before the main verb. I’ve already seen that film. I don’t want to see it again. Arriving at the bus station, I found the bus had already left. Have you already taken the money? He has already done the shopping , he is watching T.V now. Mark has already here, but John hasn’t come yet. Yet means that something that we expected has happened or hasn’t happened. We usually put it at the end of a sentence. Michael has bought a new dress but she hasn’t worn it yet. He hasn’t watered the flowers yet. It hasn’t been decided yet. We haven’t been able to solve the problem yet. She won’t have sent the email yet.